C-Wolves Finish With Huge Win!! The C-Wolves closed out their season on February 10 against the Cowboys from Chimacum in spectacular fashion, scoring a season high 78 points and allowing only 33. Coach Rap was trying to keep the boys playing hard without running up the score on an overmatched opponent, but they were just too good to hold back. They scored 18 points in each of the first three quarters and finished with 24 in the 4th. Everyone scored, even Kevin Munro who got out of his hospital bed to drain a 3 before being carried off on a stretcher. (Just kidding, but he was pretty sick!) Leading the scoring was Kai Antrim with 12. Nathan Fuentes had a career high 10 points and locked up the title for Most Improved Player during the season. Jeffery Catton, who collected one more take-a-charge milkshake, and Joe Keeler, who did not, also had 10 points each. Kevin Torres got off another over-the-shoulder no look pass to Kyle Brenske, and tallied 6 points. Brenske got 7 points, Greg Dunbar and Nick Allen had 6 a piece, and Mike Silliman tossed in 4. Jacob Blume has been one of the hardest workers in practice all year, and was rewarded by getting 4 points and scoring the last basket of the season. With the win the C-Wolves ended their season with an overall record of 5 wins and 10 losses, but against their future foes in the Nisqually League they were 5-1, for the best C-team record in the league. After starting the season by losing the first 9 games, the turn-around was nothing less than amazing as they won 5 of their last 6 games. Coach Rap had high praise for the boys for staying positive, working hard, and believing they were winners for the whole season. Most teams lose some enthusiasm as the long season nears its end, and often shorten practices. Not these future Wolves. The last practice on Wednesday went 2 hours and 10 minutes, and the team didn't want to quit then. It was a great season! The Sequim coaches are excited about the way these guys finished the year. Coach Rap said it was his favorite team ever (it's only his second year; don't tell last year's team). JV Coach Art Green is looking forward to taking them to team camp this summer. 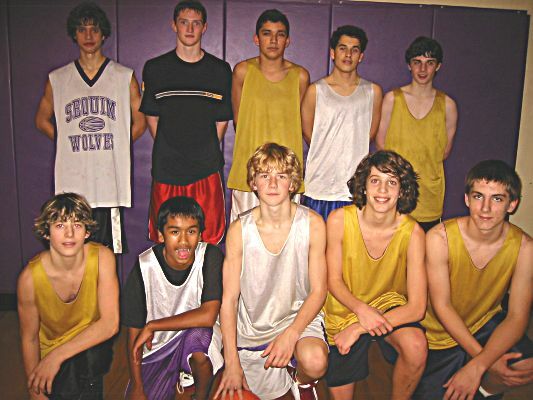 Before you know it, some of these young men will be putting on the Purple and Gold for Head Coach Brian Roper, and taking their turn on the Sequim Varsity. The winning tradition of Sequim Basketball continues! The C-Wolves hosted the Eagles from Life Christian on February 8 and racked up another league win by a score of 37-21. The full court pressure of the Wolves has become a lethal weapon as they forced the Eagles into several turnovers that converted into easy points. Kai Antrim led the scoring with 13 points, from a nice mix of fast break lay ups and mid range jumpers. Kevin Torres had his best game with 10 points, a couple of steals and some tenacious defense. Point guard Jeffrey Catton was on the money with a couple of long range passes for easy transition hoops, and tossed in 3 points. Greg Dunbar had a solid game, leading the team in rebounding and scoring 4 points. Joe Keeler and Kyle Brenske each got a bucket, and Kevin Munro, playing even though he was sick, nearly hit a 3 the only time he touched the ball. Nathan Fuentes ended the scoring with a rebound put-back and-one for a nice three point play. Catton collected another milkshake for taking a charge, while Joe showed once again that he doesn't like milkshakes by stepping out of the way at the last instant. The C-Wolves are now 4-1 against Nisqually League opponents and can claim the C-League title by beating Chimacum on Thursday. Coach Rap is really pleased with the improvement in team play that the boys have shown this year. Beating Chimacum would be a great way to ice the cake. The C-Wolves hosted South Whidbey on Saturday February 5 and saw their fledgling winning streak fly away in the Falcons talons as they lost 31-37. It was a close game for all 32 minutes, and the difference was free throws made by the Falcons in the last 2 minutes. Defensively both teams were tenacious, with easy baskets few and far between. At halftime the Falcons led 14-10, their points coming mostly from posting up the smaller Wolves. During the break Coach R told the boys to switch to a 2-3 zone, and the Falcons struggled with their outside shots, scoring only 6 in the third quarter. At the end of three Sequim trailed by just one point at 19-20, but the ball just wouldn't fall for them in the fourth quarter. Nathan Fuentes had 2 strong rebounds and put-backs for 4 points. Greg Dunbar played well, scoring 10 points and controlling the boards. The backcourt duo of Antrim and Catton combined for 10 points, and Kevin Torres, Joe Keeler, and Mike Silliman each tossed in one hoop. Nick Allen completed the scoring with a free throw. Coach R had the quote of the game when he told the referee after a really late call, "If that was any later it would have been yesterday." Kevin Munro said he thought it should have been "tomorrow", but agreed that it was funny. Even though the winning streak ended, Coach Rap told the players that it was a game they could feel good about. On to Forks on Monday, then Life Christian and Chimacum at home on Tuesday and Wednesday. Winning isn't everything, but it beats the heck out of losing. Facing the Bulldogs from North Mason for the third time after splitting the first two games the C-Wolves kept their winning streak alive as they came out hot and took the rubber match by a score of 55-35. The Bulldogs never were in this one as the Wolves jumped out to a 9-0 lead on the way to 19-5 at the end of the first quarter. Leading rebounder Greg Dunbar had to sit the second quarter out with three fouls, but the team still cruised to a 31-15 lead at the half. Coach Rap was not taking anything for granted and warned the boys at halftime to expect North to make some runs in the second half. Even with his team leading after three by a score of 43-26 Coach R said, "This is still not out of reach." Take a chill pill coach, because this time there was no let down as the Wolves continued to outplay the boys from Belfair down the stretch, increasing the final margin to 20. Highlights included Kyle Brenske's long 2 (must have had a toenail over the line), and his hustle play that saw him make a steal, bobble the ball, and end up sliding headfirst into the end wall trying to save it. Awesome effort! Jacob Blume pulled down 4 rebounds, and put the ball on the rim twice only to see it trickle off to the side. Kevin Torres got a loose ball on his knees at the baseline and somehow threw a strike over everyone to Brenske heading for our basket at half court. Nathan Fuentes led a flurry of offensive rebounding in the fourth quarter. Leading the scoring again was "Mr. Jump-Stop", Kai Antrim, with 19 points. Dunbar and Mike Silliman had 8 a piece; Nick Allen and Torres had a pair of 5's; birthday boy Jeffrey Catton and Joe Keeler had 4 each; and Brenske tossed in the long 2. At the line the team was 7 for 12. With league games against Life Christian and Klahowya next week the C-Wolves are in position to claim the League Title if they win out. Next up is an early 3:15 game with South Whidbey this Saturday February 5. They say once a farm-dog starts eating chickens it's hard to break him of the habit. Well, the C-Wolves have the taste of victory now, and it looks like they are going to keep doing it. They took the long, foggy ferry trip to Vashon Island and plundered the Pirate's treasure by a score of 45-40. The game was a mirror image of several early season losses where the Wolves got in a big hole early and clawed their way back for the rest of the game. This time they pulled away steadily through 3 quarters, taking a 37-23 lead into the last frame. But the Pirates had some powder left, and started sending the Wolves to the line. The boys had been pretty good through 3 quarters, hitting 9 of 16. But in crunch time they went only 2 for 11, and the Pirates outscored them 17-8 in the 4th quarter. Coach R reminded his players after the game that sometimes you win according to the score, but lose if your effort isn't as good as your opponents' for the whole game. The transition game was good for the Wolves as the starting guards, Catton and Antrim, combined for 27 points, mostly off fast breaks. Nathan Fuentes had his best game of the year with several rebounds, a couple of steals, 3 points and no traveling violations! Greg Dunbar had some important rebounds down the stretch, and 8 Wolves scored in the game. Next up is a rematch with Forks. The winning streak is at 2 and counting! Coach Rap said it all as the buzzer went off on the C-Wolves first victory of the season. He looked at Coach Berg, turned around, and said "Take this monkey off my back!" The Wolves had lost a heart-breaker in overtime at North Mason back in December, and they came out Wednesday night committed to getting the win, and they got the job done 55-50. After an uninspired first quarter by the Wolves, the Bulldogs went on a run and pushed the lead up to ten points. Coach R called a time out, and for the first time really lit into the team. He said "Look you guys, win or lose I don't care. But you have got to play hard all the time!" Sometimes it works. The Wolves came out fired up, and led by Kevin Torres's example fought back to within 2 by the break. Kevin had a great steal and put-back right under the hoop that really got the team going. Kai Antrim had 8 points in the 2nd quarter, and finished with 18 to again lead all scorers. At half-time Coach R told the boys that they had finished the half well, but they needed to go out with intensity and get the win. And they did. The Wolves outscored the Bulldogs 25-18 in the second half. Jeffrey Catton bothered their point guards all night with relentless pressure defense, and threw in 8 points too. Greg Dunbar had a break-out game, scoring 16 points and playing tough and smart down the stretch. Mike Silliman played most of the 4th quarter with 4 fouls, and came up with some huge rebounds when we needed them the most. Joe Keeler put up 6 points on 3 soft jumpers. As the buzzer sounded the team celebrated a well deserved victory, and received a standing ovation from the crowd (OK, it was their parents) as they headed for the locker-room. Head Varsity Coach Brian Roper said after the game that he was really pleased with the progress this team has made, and he complimented them on staying together and putting each other up, not down, through the long losing streak. Which is officially over!! The C-Wolves took on Bainbridge for the third time, and they got closer but couldn't get over the hump, losing by a score of 41-48. The first half was excellent as the young Wolves beat the man to man pressure easily, forcing the Spartans into committing 14 fouls and making them drop back into a zone defense. Unfortunately the Wolves went cold trying to shoot over it, and trailed at halftime 22-25. They stayed with Bainbridge in the second half, but just couldn't put a run together to pull even. The team's leading scorer, Kai Antrim, tossed in another 12 points, half from the charity stripe. The clinic put on by 11 year-old Evan Hill during practice last week definitely helped, as he showed the team how to shoot free throws by drilling 8 in a row. Kevin Munro hit a nice 3 in the 4th quarter. Greg Dunbar had 8 points and some nice blocked shots. Coach R is still looking for Greg to stand tall and take a charge. The Wolves dropped their three games with Bainbridge by 21, 15, and 7 points and the improvement was not lost on Coach Rap. He told the boys that they were playing good enough to win, and the rematch with North Mason set for the next day was going to be the one they've been working so hard for: their first W! On Tuesday,the C-Wolves hosted Forks in a rematch of the third game of the season. The Sequim boys fell in the first match 50-38 after leading at halftime and were looking to take the Spartans down this time. For three quarters they were on track to get that elusive first win as they took an 8 point lead into the fourth quarter. Kai Antrim was phenomenal, putting up 18 points through three quarters, and posting 20 for the game. Then in an all too familiar scenario they faltered and the young Spartans roared back with an 18 point spurt to jump ahead and take the game 53-49. Coach Rap observed that sometimes learning how to play when you're ahead is hard. The team has learned how to play from behind and catch up, but being ahead is still a new experience. Greg Dunbar had some nice blocks and tallied 9 points. Nick Allen had 7 and Jeffrey Catton tossed in 6. Coach R noticed we only got 2 points from our big guys in the post, and said we're going to need more from them to get that number 1 in the "W" column. January 6, in a rematch the with the young Roughriders from PA, the C-Wolves continued to show improvement, but came up short again on the scoreboard 47-33. The boys from the Port were just a little bigger and stronger, and their pressure defense created too many turnovers for the young Wolves. The aggressive 'Riders sent the Wolves to the line for 30 free-throws, but they only converted 14 into points. Coach Rap has set a team goal of 60%, and the boys are doing a lot of push-ups as they work to reach it. Scoring was balanced as Jeffrey Catton, Joe Keeler, and Mike Silliman each had 6, while Kai Antrim and Greg Dunbar had 5 each. Coach R liked the pace of the fourth quarter when the Wolves were pressing man-to-man full court, and he told the team that they'll be doing a lot more of that from here on out. While the results in the wins and losses columns are still disappointing, Coach Rap is still pleased with the effort the boys are giving every game. The C-Wolves tipped it off with Bainbridge in Sequim Saturday, hoping to avenge a loss from earlier in the week. Getting off to a better start the boys played a good first half, trailing by three at the break. Bainbridge used a half-court trapping defense that caused some problems in the 3rd quarter when the Wolves got only a single bucket from Greg Dunbar, and fell behind by 12. But after listening to Coach Rap’s adjustments between the quarters, Joe Keeler came out with his best quarter of the year, netting 6 points on some nifty moves down the lane. The Wolves came up short 31-46, but Bainbridge has some huge kids for a C-team, and Coach R was mainly pleased with his team’s effort. Dunbar and Antrim both tossed in 7 points, and Kevin Torres had 4. Mike Silliman earned a “take-a-charge” milkshake with some nice help defense in the paint. The C-Wolves are off for the Holiday Break, but they have a New Year’s Resolution for their next game on January 4: Beat Chimacum!! The C-Wolves traveled to North Mason on December 17 for their first game against a Nisqually League foe. After an icy first quarter that saw Jeffrey Catton score the only 2 points for the team, they settled down and played their best game so far. Going into the 4th quarter trailing by 5, the young Wolves scrambled back with their full-court man-to-man press, out scoring the Bulldog-pups 17-12. Trailing by one with less than 5 seconds left, Kai Antrim drove the right side and was fouled in the act of shooting as regulation time expired. Stepping to the line with a chance to tie and win the game Kai drained the first free-throw, making it 40-40, to guarantee at least overtime. As his teammates watched intently, and the opposing fans went crazy making noise, Antrim calmly arched the second free-throw into the hoop-only to see it hit the back rim and bounce out. Overtime! In the extra period the Bull-pups decided to make the Wolves win it from the charity stripe, sending them to the line for ten free-throws. Unfortunately they could only convert on 4, and lost the game 44-48. Leading the scoring again was Antrim with 14 points, 7 coming in the 4th quarter comeback. Catton had 11, and Greg Dunbar threw in 8. Kevin Torres played solid again, and had a huge 3 pointer in the 4th quarter. Overall the C-wolves were 17 for 36 from the free-throw line; if they make just 5 more of those they win! Coach R had high praise for the team after the game, saying that this was the kind of game where you can feel like you won because of the excellent effort, in spite of coming up short on the scoreboard. The C-Wolves headed down the highway to Bainbridge Island on Tuesday 12/14. Final results were not available at press time, but in the 3rd quarter the young Wolves were leading the Spartans 31-29. Scoring was balanced, as 7 players got points in the book, led by Greg Dunbar's 10. Joe Keeler and Kai Antrim both netted 6 points. Jeffrey Catton handled the press well at the point and dished out some pretty assists. Kevin Torres turned in another solid defensive effort and added 4 points too. Matt Mustich was a force on the boards, pulling down several rebounds and playing some tenacious D.
Coach R was pleased with the effort, but restated "We just need to put together 4 solid quarters in the same game." For one half the C-Wolves continued the improvement they showed in the second half of the PA game when they hosted Forks, Friday. For the first half they were a well-oiled machine, taking an 18-13 lead into half-time. Then the wheels fell off. Several defensive miscues and some mental lapses allowed Forks to take the lead by the end of the third quarter and coast to a 50-38 win. Coach Rap talked about maintaining intensity for the whole game, not just for a half. There were some bright spots too. Returning to spark the team’s effort was freshman Greg Dunbar, who netted 10 points and some great blocks. Kai Antrim turned in another strong game with 12 points and some good defense. Jeffrey Catton threw in 9 points and also drew the first charge of the season, claiming the first milk-shake reward from assistant coach Brian Berg. Kevin Torres had a nice steal and took it coast-to-coast for the bucket. Coach R told the team that they had let one get away. They are fired up to get one in the W column soon. The team traveled to PA on December 7 and got blitzed in the first half like the U.S. Navy at Pearl Harbor. At halftime it was 41-14 for the young Roughriders. But Coach R rallied the troops at halftime and they came out like a new team with fire in their eyes for the second half. Playing a scrambling 2-3 zone led by the dervish-like efforts of Kai Antrim and Jeffrey Catton the C-Wolves fought back, outscoring PA 27-17 in the second half. Coach Rap waxed philosophically after the game that sometimes you can win but really lose if you don’t give your best effort, and sometimes you can lose according to the score but win because you gave it your all. Or something like that. The game was much closer than the 58-41 final score indicates. Leading scorers were Antrim with 14 pts and a pair of 3’s, Nick Allen with 9 sweet second-half points from the short corner, and Catton with 7. Mike Silliman, who has been playing basketball only 6 months, continues to get better everyday. Kevin Torres had a solid game at the 2-guard position. The C-Wolves got off to a rocky start at Franklin Pierce on Friday, 12/4, losing 61-34. The Cardinals had a 6’4” post player who lit it up for 18 points. Coach Isaac Rapelje was pleased with the team’s effort, but was quoted as saying “We have a lot to work on.” Leading scorers for the C-Wolves were Jeffrey Catton with 13 pts. and Nick Allen with 8. All content of the SSABC Web page is for information and entertainment.